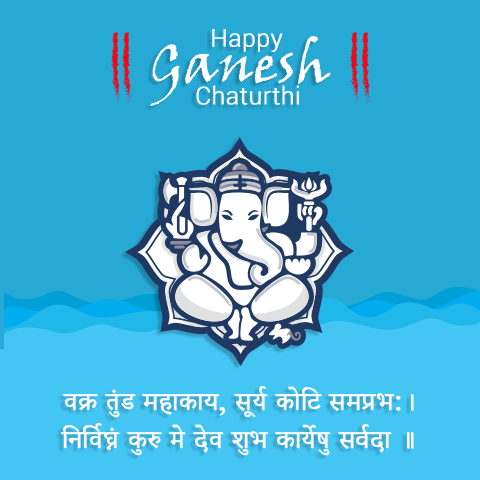 Ganesh Chaturthi is one of the most important Hindu festivals in India. Hindus throughout the world celebrate the birth of the elephant god Ganesha every year in the Hindu month of Bhadra (mid-August to mid-September). Ganesha is regarded as the incarnation of wisdom, happiness and success and as a destroyer of evil and hindrances. Hindu believers begin almost nothing without Ganesha's assistance. In the state of Maharashtra, the elephant god is celebrated particularly wildly. The festival lasts for ten days. Also Hyderabad, Chennai and Bangalore are among the strongholds of the Ganesha celebrations. Ganesha was the son of Lord Shiva and his wife Parvati and originally a very normal infant. However, Parvati herself had created him when Shiva was not at home. She formed him from clay, poured him with water from the Ganges and thus brought him to life. Then she set Ganesha as a guard in front of her house. When Shiva returned home, Ganesha blocked him. Furiously, Shiva struck the stranger's head. Parvati collapsed with grief at the death of her son. To console her, Shiva sent out his followers, who were to bring him the head of the first creature that they would find sleeping. The troops found a young sleeping elephant and brought Shiva his head, which Shiva attached to the boy's body. Shiva gave Ganesha his life back and made him the leader of his army. Since then, he has been called "Ganapati". There is another version of the story that is less popular. In this version, Shiva begged his wife Parvati to fast for a year (the so-called punyaka vrata) to please Vishnu and give birth to a son. When a son was born, all gods and goddesses came to celebrate his birth. Lord Shani, son of the sun god Surya, was also present, but the child refused to look. Irritated by this behaviour, Parvati asked him why he was looking away. Shani explained that his gaze could harm the child. But Parvati insisted that he look at her son. The moment Shani did this, the head of the child was cut off. The gods lamented, but Vishnu hurried to the banks of the Pushpabhadra River and brought the head of a young elephant from there. He put it on the boy's body and brought him back to life. On these days, all the communities gather in India to celebrate Ganesha. It is a joyous festival - and sometimes it is associated with pleasant side effects, because often during the festival you also get a free medical check-up in the tents, there are places to donate blood, charity events for the poor, theater and film shows and much more.